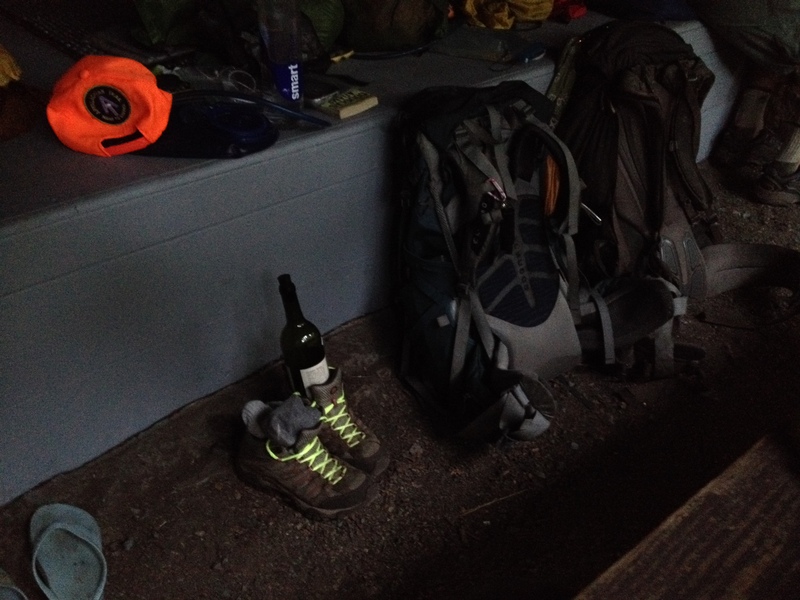 It was a dark and thirsty night, but the old folks at Pinefield Hut didn’t know that yet. Meanwhile, day three of my Appalachian Trail training hike had just closed. In spite of my heavy pack, I’d made good time walking on the contoured terrain around the Loft Mountain camp ground. Put it in the books as a good day. There I was making camp with a couple of younger guys just out of the Army and an older 70-something thru hiker recently back on the trail following a long injury recovery. He was hiking from his home near Delaware Water Gap to the place in southern Virginia where he had to leave the trail this past spring with his hopes for completion long dashed. It was dark and quiet with hiker midnight fast approaching. The military guys decided to tent leaving the shelter to the two older guys. It would be my second night in a shelter, but given the hour, it didn’t seem like we should be expecting more company. Just as we were settling in a couple of young Millennials drifted in. One was a young woman whose blog I’d read and we had a nice conversation about that and other mundane aspects of the trail. Than a few more young faces drifted in from the darkness – and a few more after that. The dynamic of one of those You Tube flash mobs quickly took over. Once the crowd reached critical mass, out came beer, wine in one and two liter bottles. In a flash the picnic table was groaning under their weight. I checked my watch. Ten thirty. For me, it was past time to sleep. For them it was party time. A roaring fire accompanied a solo guitar. Alcohol fueled voices harmonized – more or less. The rowdy revelry continued well into the wee hours before dawn. The other adult hiker and I scrunched into the deep shadowy recesses of the shelter and tried to sleep, me with my iPod cranking out an alternative soundtrack. It was a stereotypical display of Millennial self-absorption. I generally hold young folks in high regard having worked with 18 – 24 year-olds most of my life. This group, other than being inconsiderate, wasn’t that bad with a couple of obnoxious exceptions. As minor payback I certainly didn’t hesitate to make noise when I broke camp at the onset of morning nautical twilight. One thing came out of it, a new song to add to my AT playlist. Judy Collins’ “Send in the Clowns” seems a most appropriate way to memorialize the evening.